Dogs can be trained to stop virtually all undesirable behaviors, including constant barking, rowdiness and jumping up on visitors. This article provides information on correcting actions of dogs using proper training techniques. A well trained dog makes a great pet. If you are working on crate training your indoor puppy or dog, you can always try a few tricks. If the dog doesn’t want to go inside the crate, put a rawhide bone in there and shut the door. They can see and smell that bone, and they will want in the crate to have it. Praise your dog once he gets into the crate. With aggressive dogs it is best to begin slowly. Aggressive dogs see themselves as the dominant role in the pack and trying to take that role from them too quickly can result in a negative response from the animal. To avoid bites or difficulty, take small steps in establishing yourself as the pack leader. Don’t expect too much of your dog, too soon. Puppies will be puppies. That is what makes them so cute. The key to training them to act appropriately, is consistency. 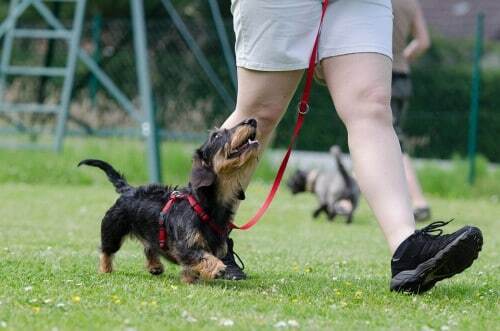 Be consistent in immediately reinforcing good behavior and eventually, your dog will get the message. Just don’t expect them to become fully trained overnight. Make sure that the only items your dog can reach are chew toys that are specifically made for dogs. Offer your puppy a variety of acceptable items to chew on. If the puppy is suffering any pain from teething, freeze a wet washcloth for him or her to chew on. It is important for dog owners to realize that training no longer has to be a battle. With the right mindset and good information, the owner can accomplish successfully training their companion. Dogs are very smart and well apt to learning.